Musical Theatre students from the Tshwane University of Technology (TUT) will strut their stuff at one the country’s most iconic theatres, The Market Theatre in Newtown, Johannesburg, when they stage SHOWTIME 2018 on 31 August and 1 September. SHOWTIME 2018, now in its sixth year, is an innovative platform for third-year Musical Theatre students from the Department of Performing Arts, designed to showcase their accumulated knowledge and skill through original, creative outputs as emerging scriptwriters, composers and choreographers. 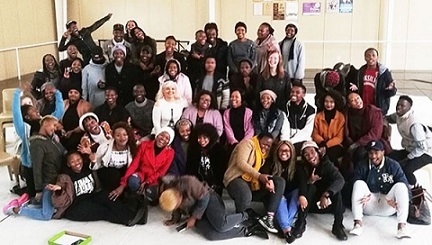 Musical Theatre Programme Coordinator and Lecturer, Rostislava Pashkevitch, and Artistic Director of the Market Theatre Foundation, James Ngcobo, had been conceptualising the sixth edition of this unique festival to take place at The Market Theatre. “Our dream to see students share their vision and performance with audiences of this historical theatre is finally coming to fruition,” says Rostislava. “Collaboration of this nature endeavours to expand new horizons and empower students with professional skills, which will assist them in their future careers as creators and performers in the genre of Musical Theatre,” she indicates. • The Jam by Sindisile Nkuna • Wafa by Anela Ngxabani • The Birth Mark by Kim Mdaka • Death Comes for Wedding by Sara Ntombela • InJusticeby Eutychia Rakaki • The Virginia Concert Company by Katlego Moncho • Coconuts the Musical by Avril Mkansi • That Kofifi Kind of Love by Lufuno Ndou • Grease by Khumbulani Bonani • Ukuthwalwa #Arranged Marriage by Kwandubuhle Mndebele • O’Makhelwane (The Neighbours) by Thabiso Chule • The Glen of Silence by Innocentia Moshoeu • Nothing Conquers Hope by Promise Magopa • Ubizo (The Calling) by Thando Mdluli • In Transit the Musical by Dimpho Tshale • Rangi Ya Ngozi by Lorraincia Maile. Performances start at 20:00. Tickets (R65 to R70) are available at the Theatre (Box Office) and www.webtickets.co.za.